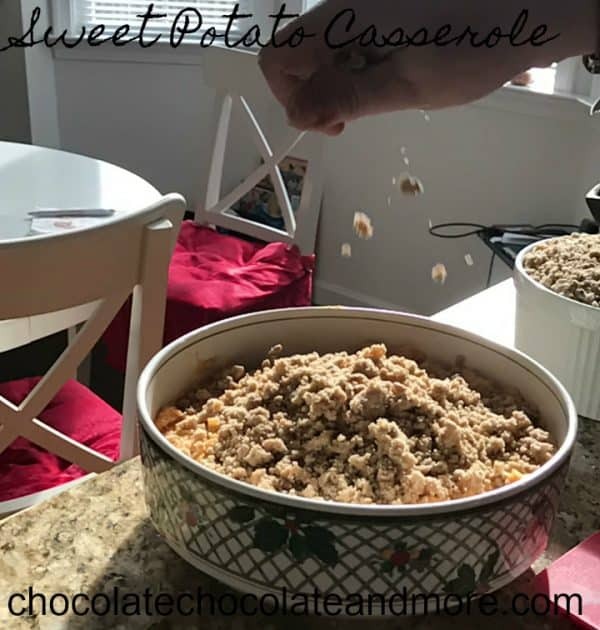 Praline Sweet Potato Casserole - Chocolate Chocolate and More! Praline sweet potato casserole is a family favorite in our house. What’s not to love – sweet potatoes with a pecan praline praline topping! 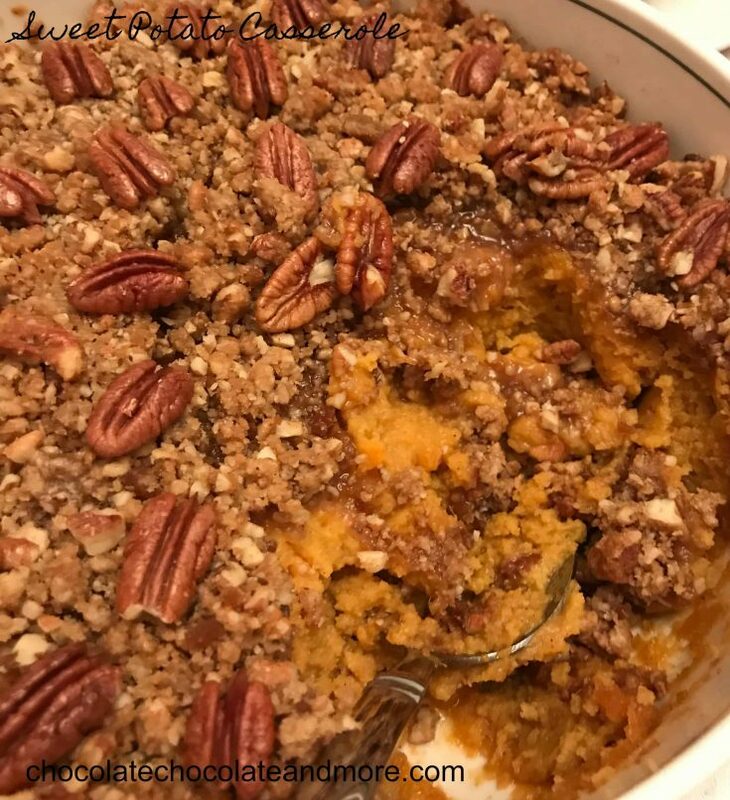 This praline sweet potato casserole is a family favorite of ours. It isn’t one that has been passed through the generations, but instead comes from back when I was working as a news producer at a local station in Tampa, FL. One of my jobs was to produce a weekly cooking segment with one of our weather folks (her name was Laura), and one week, she did a group of holiday side dishes. I fell in love with two of them, and after making them for the family (this is about 20 years ago), they have become a staple in our holiday meals. 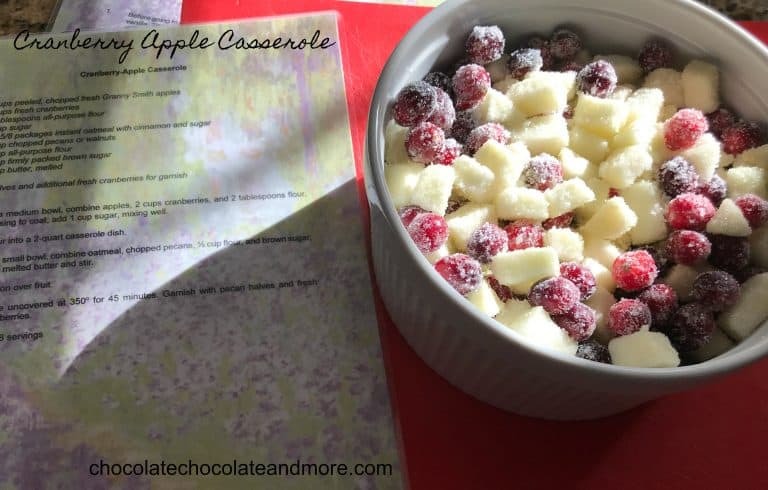 The casserole is very simple to make. We actually pre-make our side dishes while the turkey is baking, and then set them aside in the refrigerator until the turkey is out of the oven. The temperature for the bird and the sides is the same, so once the bird comes out, the sides go in. You don’t have to have a holiday to make this dish..so don’t look at this as just a Thanksgiving, Christmas or Easter side. Sweet potatoes are available all year round, so you could make this for a summer picnic, or a family dinner in place of plain old mashed potatoes. 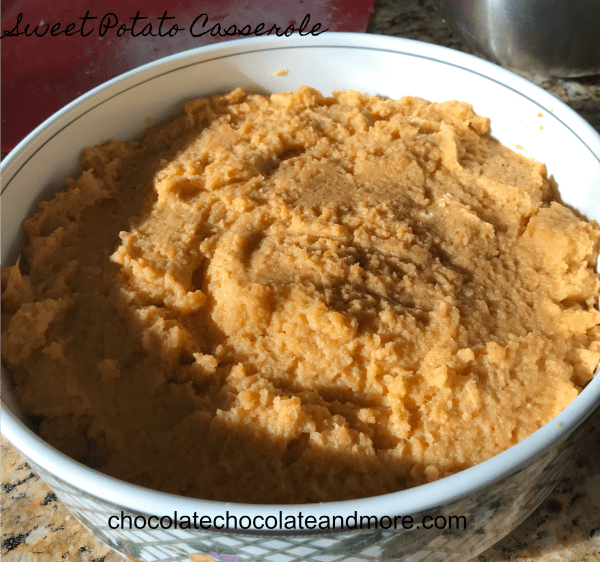 If you don’t include the boiling and mashing of the potatoes, the actual preparation for the sweet potato casserole is all of about 10 minutes, and as you can see from the video, it is very easy to do. The longest part is the baking — it takes about an hour in the oven to properly cook. But your kitchen will smell amazing while you wait! Stir in potatoes until blended. Mix sugar, flour, and nuts in a medium-sized bowl. Work in butter with hands until well blended. Bake 60-70 minutes until topping is brown and bubbling. Nutrition information is provided as a guideline only. Please consult a dietician if you have specific dietary requirements.